Batavia boys track recently garnered another achievement by claiming an Upstate Eight Conference win on Sat., March 17. Batavia won seven events at the meet, winning events like the 55-meter hurdles, 200-meters, 800-meters, and shotput. West Aurora finished second behind the Bulldogs with 91 points to Batavia’s 170.5 points. This Batavia victory was bittersweet, though. This will be Batavia’s last year in the Upstate Eight Conference. Leaving along with Batavia will also be Geneva and the two other St. Charles high schools. Led by Tori Ortiz, the girls’ varsity team placed second at the meet, with the team only falling ten points behind the defending champions West Aurora with a 124.5 to 114.5 loss. Assistant track coach and head girls’ cross country coach Chad Hillman said he sees potential in track athletes coming from lower grade levels, especially the ascending freshmen. 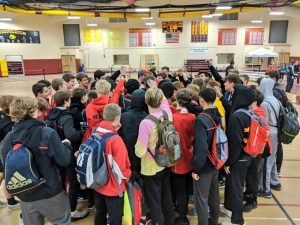 The Batavia track team is an overall successful group based on their stats, coaches and players believe in each other and the other athletes as seen in quotes, making the team an overall tight-knit group. Also, making the achievements that more special. Batavia’s track is winning events and topping categories at an extremely rapid rate.